Ever wonder what would happen if Plato’s Republic were real? 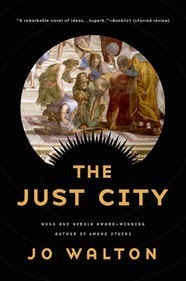 Well, The Just City by Jo Walton answers that question. In this first installment of a proposed trilogy, the goddess Athene collects those individuals throughout time who explicitly prayed to her asking for the opportunity to live in Plato's just city. These individuals (a.k.a. the masters) include famous and not-so-famous Classical and Renaissance philosophers, and other regular but scholarly people from all levels history and the future; and some gnarly robots are thrown in do all the dirty work. Athene selects a Grecian Island situated around a dormant volcano for the City's location…presumably so that all evidence can be eradicated when she tires of her experiment or if it goes awry (coughAtlantiscough). The details of the City are left to the masters, and they mull over everything from art to electricity to birth control. The City is then filled with over ten thousand 10-year olds purchased via slave trade (a.k.a. the children). In many ways, the City is wonderful. Plato was a revolutionary in his time because, among other things, he wrote on women’s equality in an age when they were barely considered people (see note). The City really tries to capture that spirit, along with the idea of the greater good and the idealized self. As to be expected though, practice does not always concede to theory and there is something inherently creepy about the City. Some things I can’t exactly put a finger on, some things I can, but I tell you, I would NOT want to live there. Especially as a woman. The Just City, as in the book, is phenomenal. I couldn’t put it down. It is told from the perspective of three characters: Maia, one of the City’s masters; Simmea, one of the City’s children; and the god Apollo. And I really love Walton’s take on Apollo. She finds in him the compassion, humanity, and humility that he is most often denied in artistic representation. My only gripe with the book is the ending. I feel that Athene’s action leading up to the end was very out of character for her, both the Classical representation of the goddess and the one portrayed in The Just City. I don’t believe she would have agreed to what she agreed to in the first place. 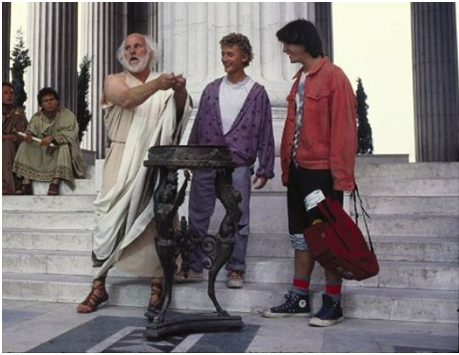 As for her actions at the very end…well they were most definitely Athenian. All in all, The Just City is terrific. I love modern stories where the Greek Gods interact with humans, and this one is up there with the best I’ve read. It is fun and different and smart and thought provoking. What I love most about The Just City is that, for me, the most important questions were asked only once and were never given an answer, thus leaving them to roll around in my brain forever. I suggest reading this book even if you don’t like reading Classical philosophy. It’s a great way to learn the tenets of such without trudging through the works themselves. It's no secret that Plato doesn't exactly write page-turners, but lucky for us, Jo Walton does.